Camp Ground United Methodist Church in Fayetteville, North Carolina is looking for a pianist to play once a month for the 8:30 and 11:00 services. Necessary music would include a prelude, three hymns, an offertory, and a postlude. Interested individuals should contact Victoria Wood at ayrotciv@windstream.net. A pianist is needed for Saturday, July 11, at the Orangery at the Cape Fear Botanical Gardens. This event is the instillation of the Rotary International District 7730 Governor. Approximately 180 civic leaders from all over Southeastern North Carolina will be in attendance. The pianist would play background music for approximately two hours that evening, beginning at 6:30. The Cape Fear Botanical Gardens does not have a piano, so the pianist would need to bring a keyboard. Contact Information: David Baggett: dg7730.15.16@gmail.com, cell: 910-309-1061. Trinity Christian Fellowship Church in Pinehurst, NC is seeking a pianist. Sunday services begin at 10:30, and choir rehearsals are at 5:00p.m. For more information, please contact Rita at rbyles@trinitycf.net. Results are in for the Fayetteville Piano Teachers Association Competition. Winners are listed below. The Honors’ Recital will take place on Saturday, May 16th, at 12:30 at Hensdale Chapel at Methodist University. Dr. Amanda Virelles will open the recital with a brief discussion on proper posture and hand position. All competition participants are welcome to attend the recital. Thank you to all of the teachers for your participation. There is a church accompanist position available at one of the chapels on Fort Bragg. Those who are interested in information concerning service times, worship, and compensation should contact Joy Diaz: 407-602-7780 Ext 104; joy@sawyercontracting.com. Anderson Creek Club-Woman’s Club is hosting a music competition for students grades 9-12. The 1st round of competition is this Saturday, 10 January. Students must play a classical piece at least 2 minutes long. The winner will go on to compete in the District Festival in Raleigh on Saturday, February 7 against 9 other regional winners. The winner of that round will go on to compete in the State Festival on Saturday, March 7. For more information, please contact Natalie Whittington at 334-220-3092 or natalie.a.whittington@gmail.com. The Music Contests are open to grades 9-12. Contestants must perform one or two classical compositions of their own choice that may include arts songs or opera. [No Broadway, modern jazz, gospel (including hymns), country-western, “pop” or improvisation will be accepted.] When questioning the appropriateness of a composition, contact the Music Chair, Sandie Werderman at swerderman@centurylink.net or at 910-814-0925. Time limits must be observed. Minimum: three (3) minutes. Maximum: five (5) minutes. Piano and Vocal contestants must perform from memory. Three (3) copies of the composition(s) to be performed must be brought for the judges’ use. At least one copy of the composition(s) must be an original copy. All contestants must be available to audition for the Anderson Creek Club Arts Festival, the District VI Arts Festival and the State Arts Festival. 7. The ACC-Woman’s Club Chair, Music Contests will coordinate the following with the piano and vocal contest winners: the dates and times to audition, and completion of the GFWC ENTRY FORM AND PARENT/GUARDIAN RELEASE FORM. These forms are required to compete at the District VI and State Arts Festivals. Fayetteville Piano Teachers Association will hold its annual competition in April. More information will be announced soon. Repertoire lists and contest rules can be found on the FPTA website. The fall FPTA student recital is scheduled for Saturday, December 6th, at 5:00p.m. at Hensdale Chapel at Methodist University. FPTA members may submit up to three students to perform in the recital. Depending on the length of each student’s piece, it may be possible to submit more than three students (beginner students’ pieces take much less time than say, a Beethoven sonata). Please submit all information for the recital (including students’ names, title of pieces, opus number, composer, and duration of each piece) no later than December 1st. Please email the information to fay.ncpianoteachers@hotmail.com. Annual dues are due by Monday, December 1st. The fee is $45 for the year. Please note that dues must be paid in order to participate in the recitals and other FPTA activities. For information on dues, including the mailing address, please email fay.ncpianoteachers@hotmail.com. 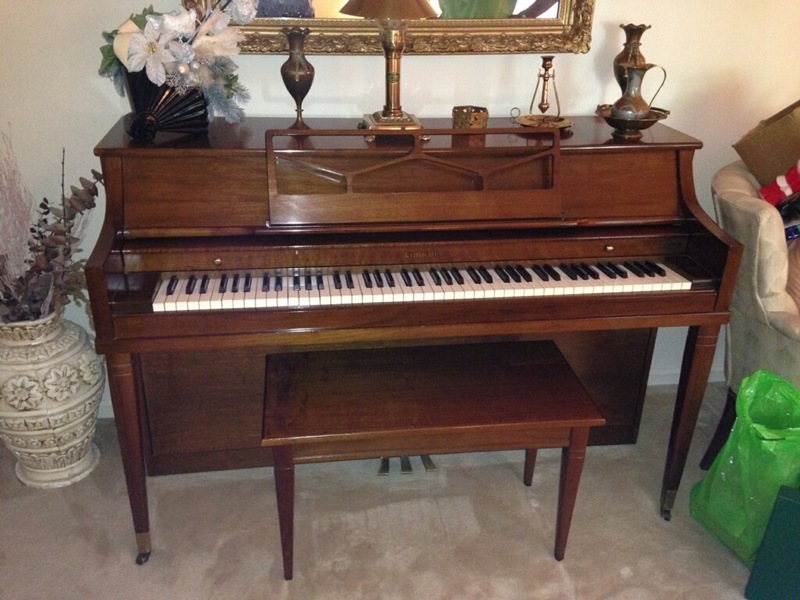 Piano for Sale: Kimball Upright. $400. This would make a great practice instrument for students. For more information, please contact: Pam Warren, (910)321-0016.